A simple tool which allows the user to download the content of a specified URL. The tool can be used as a part of a tool-chain. Shadow Map Silhouette Recevorization (SMSR) is a filtering technique which re-approximates shadow silhouette based on MLAA implementation for GPU. SMSR consists of two main passes. First pass searches for discontinuity information. Second pass determines the discontinuity length, orientated normalized discontinuity space, fills new edge area and eventually merges lighting or image buffer with new edge information. SMSR v1.10. In second pass, calculating word-space to light-view space only once per fragment. SMSR filtering time on GTX 580 1920×1200, from 1.50ms to 1.25ms and 1.21ms on a non-presentation version. Figure 1 – A scene with severely undersampled shadows (64×64 shadow map). 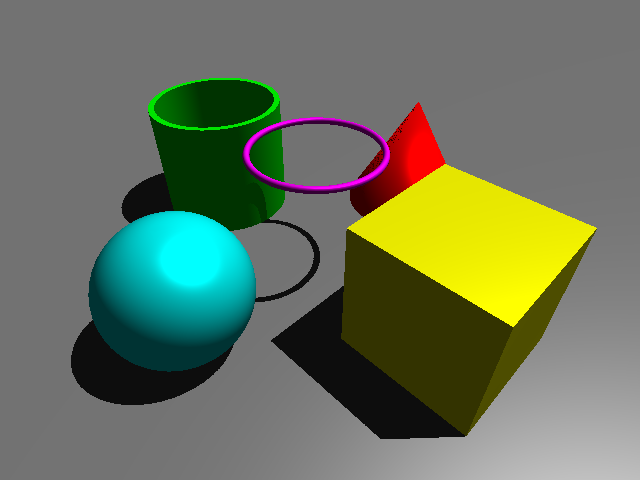 Figure 2 – Shadow map 64×64 samples, upscaled 4x. Uniform sample distribution. A shadow map is generated by rendering “shadow casting” geometry from the light-view-perspective and saving the distance to the nearest surface (from the light-view) into the depth-buffer. So the “shadow map” is basically a texture containing rays. 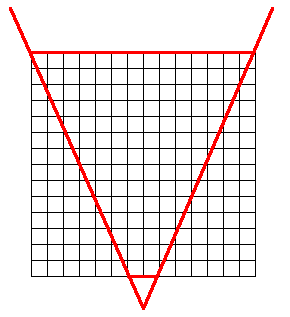 Ray-position and direction is represented by the pixel-coordinate multiplied by the light-view-matrix and ray-length is the depth. The light-visibility test is performed by comparing the distance between camera-view sample and the light-position against projected shadow map sample. If the distance between the camera-view-sample and the light position is greater than the ray-length (provided by the corresponding shadow map sample, projected onto the camera-view-surface), then the light-source is not visible. Broad utilization of shadow mapping algorithm is to thank to it’s extreme compatibility with the modern hardware rasterization technology (GPU). Modern GPUs can easily render and execute light visibility test in real-time. 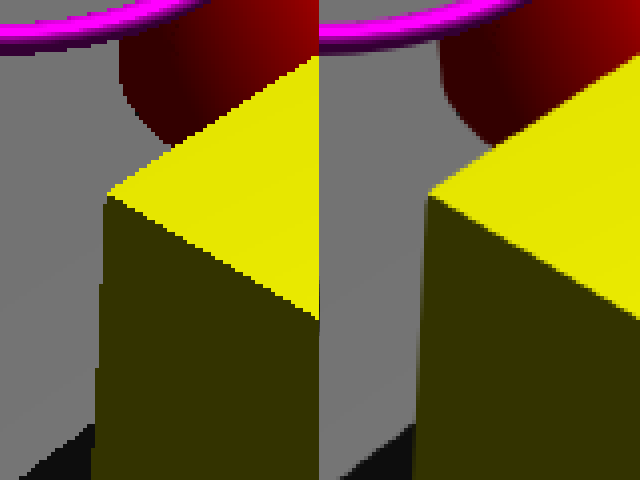 However, rasterization is also the main cause of shadow aliasing. Figure 3 – Uniform sample distribution from light-view-space (directional light). Red lines indicate camera view angle. Perspective aliasing - From the light-view-space, a standard shadow mapping algorithm has a uniform sampling distribution (can be seen on figure 2 and 3). For the visibility test, the shadow map is projected into the camera-view-space. The transformation from the light to the camera-view-space results in a non-uniform sample distribution. High sample-destiny far from the camera and low near the camera (figure 3, the near-camera-face has only 2 samples and far-camera-face has 14 samples). When a shadow map sample becomes larger than a single screen-space pixel, perspective aliasing starts to appear. Figure 4 – Shadow map sample-grid in screen-space. On figure 4, a single grid-cell represents one shadow map sample (in screen-space). 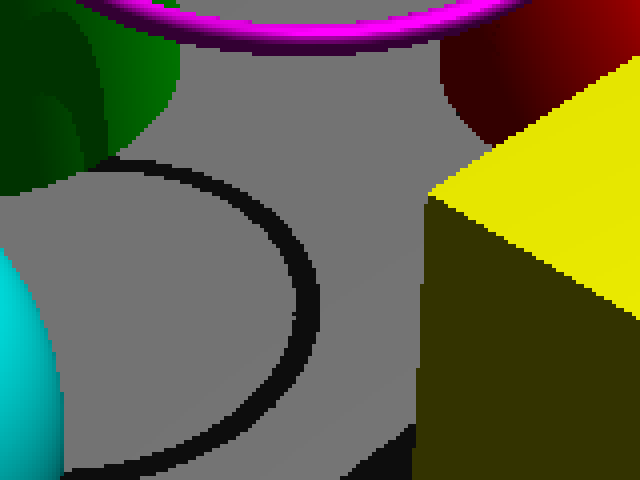 All shadow map samples are clearly larger than a single screen-space pixel, demonstrating perspective aliasing. Figure 5 – Left no bias offset, right with bias offset. A single column represents a shadow map sample. Only the center of the sample area represents the correct depth. Projection aliasing - A single shadow map sample is only able to describe a 2D-plane (surface area) which is parallel-aligned to the light. However, usually the surface is not a flat 2D-plane and thus contains more depth information that a single shadow map sample is able to describe. 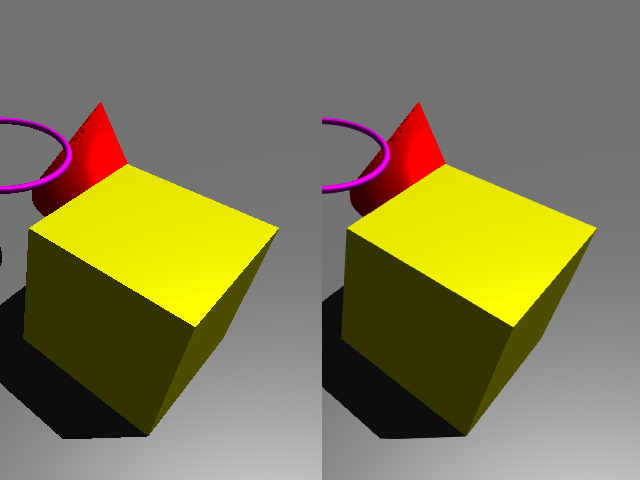 Because of this limitation some of the surface area projected in the camera space from the light space is incorrectly described and results in incorrect visibility tests (see figure 1, bottom-right surface of the yellow cube). A common “solution” to this problem is to use a small offset which will reduce the visible aliasing (see figure 5, right). This is a CG implementation of Jorge Jimenez’s HLSL MLAA with some minor adjustments and changes. The implementation consist of three main steps: discontinuity pass, blend weight pass and finally the blend pass. The core difference between Jorge Jimenez’s MLAA and original MLAA by Alexander Reshetov is the use of area-texture (explained in second step) which determines edge-blend-weighting (area-texture allows MLAA to run efficiently on a GPU) . He is also using bilinear sampling to reduce the amount of required texture fetches. Bilinear sampling allows to fetch 4 nearest pixel-samples simultaneously, which is used for edge-type classification. After an edge is classified, corresponding blend-weight is being looked up on the area-texture. Blend-weights determine the blend-intensity with nearest edge-pixels, resulting in edge re-vectorization. Test scene, zoom 1x, MLAA disabled. Test scene, zoom 4x, MLAA disabled. 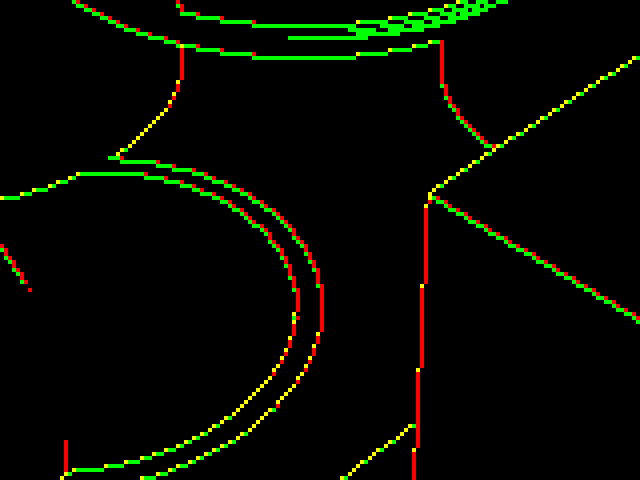 Discontinuity Pass – Edge detection. Blend Weight Pass – Edge-pattern detection and blend weight assignment. Blend Pass – Blending nearest pixels according to the sub-pixel edge weight. Shader-code uses “tex2D” and “tex2Dnearest“, “tex2D” for linear sampling and “tex2Dnearest” for nearest sampling. It is very important that nearest and linear filtering is performed correctly, otherwise blend-weighting will be incorrect! “tex2Dnearest” implementation is extremely inefficient (due to “tex2Dsize“) and is only meant for easy implementation. My image orientation space is somewhat different that used by Jorge Jimenez’s original MLAA implementation. My image zero coordinate begins from bottom-left corner, instead of traditional top-left corner. The code is some what refactored, makes it for me easier to read and may not be as fast as original implementation. All three fragment shaders use the same vertex shader provided bellow. Discontinuity pass detects geometry “edges”. If delta grayscale of a relative left pixel intensity exceeds a certain threshold (in this case 0.1), than the red channel of originating pixel will be filled with 1.0. 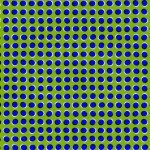 Same rule for neighboring up pixel, than the green channel will be filled with 1.0.
positive and positive becomes negative on Y axis). 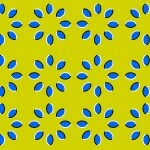 Area texture contains 4*4 = 16 edge patterns. 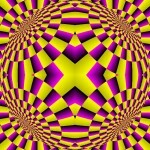 Each patter is represented by a 33×33 sub-texture. This section of algorithm is dedicated in finding edge patterns and matching corresponding blend weights. Blend weights are precalculated and stored in an area-texture (see image on the right). 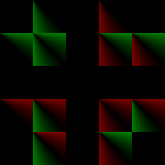 Red and green channels represent sub-pixel edge positions which determines the blend-weighting of neighboring pixels. 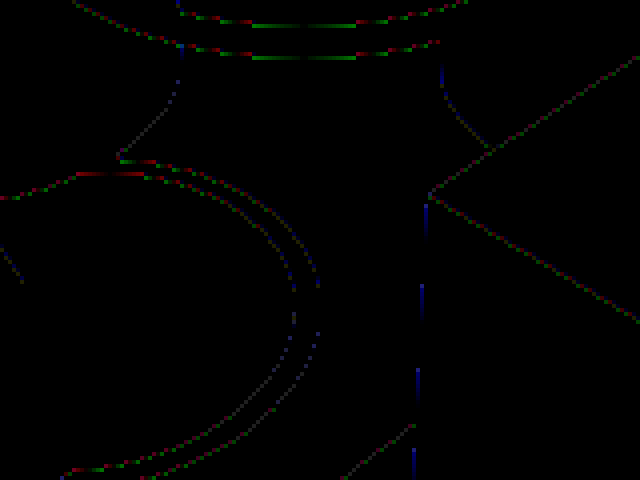 An edge-pattern (matching sub-texture) is identified by performing a cross-edge-search in both directions of current axis. For example, on horizontal discontinuity a search is performed in right and left direction (on the edge-texture, see Discontinuity Pass section). Either a crossing edge is found or maximum search distance is reached. Similar case for vertical discontinuity, up and down search must be also performed. Absolute values of both search directions (left and right or up and down) are used to construct the sub-texture coordinate (in this case sub-texture coordinate ranges from 0.0 to 0.2), which is used to fetch matching blend weight. *	inEdge1 and  inEdge2 will contain one of following scalers: 0.0, 0.25, 0.5, 0.75, 1.0.
inEdge1 and inEdge2 determine which sub-texture will be used. *	inSampleEdgePosition determines the UV texture coordinates of the sub-texture. The inSampleEdgePosition (.x and .y) range is between 0.0 and 0.2.
becomes negative on Y axis). pre-flipped to match mesh UVs. Double check that in your implementation if this is also required. Connecting pixels are bilinearly reinterpolated based on blend information provided from the blend weight pass. Result of blend pass, final image result. Zoom 4x. 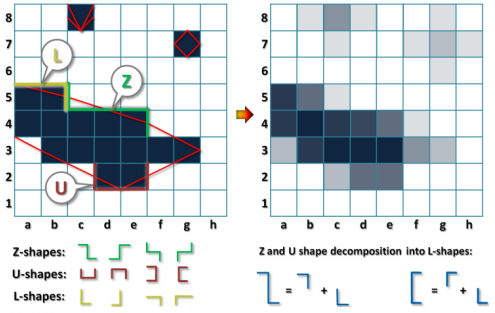 Original code discards to overwrite only applicable pixels for re-vectorization. Left MLAA disabled, Right MLAA enabled, zoom 4x. Download Win32 MLAA Example - ATI GPUs may experience incompatibility. Increased number and type of edges patterns, which helps to preserve sharp geometric features and also to process diagonal geometry edges. Improved pattern handling with a fast and accurate distance search for a more reliable edge detection. Each feature can be enabled and disabled to match the desired result. Edge re-vectorization. 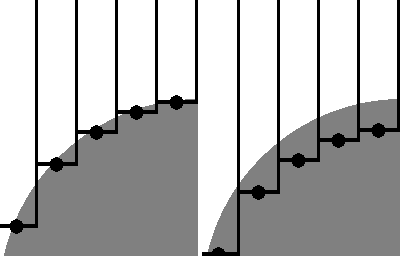 MLAA (left) and SMAA(right) with diagonal edge re-vectorization. Designed to run on a GPU. SMAA 4x, less than 3 ms execution time on GeForce GTX 470. Sharper re-vectorization than original MLAA. 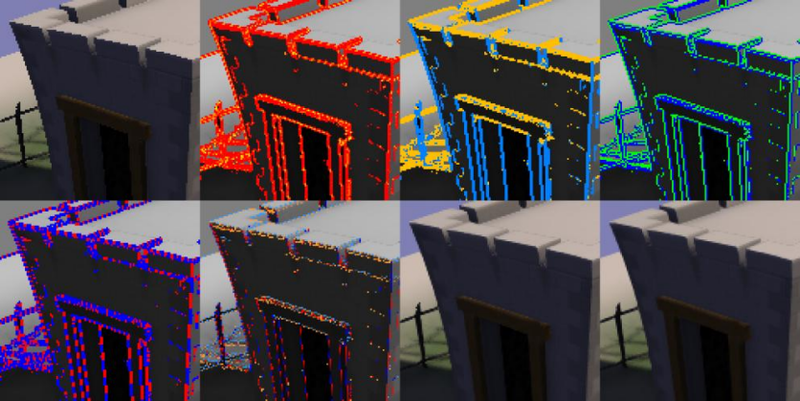 Integrated multisampling and temporal antialiasing (cures ghosting and preserves sub-pixel detail) which can be increased to preserve stability and increase sub-pixel quality for a more complex scenery. Final image quality comparable to SSAA 16x (supersampling) with a much lower execution time and memory consumption. Storing velocity module (for temporal antialiasing) in alpha channel of the color buffer may conflict with deferred rendering pipeline. Note: Precompiled demo seems to display a more sharper and stable result with MSAA 4x in contrast to SMAA 4x setting. MLAA is a universal (independent from rendering pipeline) post-processing techniques which is originally developed by Intel for (ray tracing) image based aliasing removal. Based on image, recognizing image discontinuities (by comparing neighboring horizontal and vertical pixels). Based on discontinuities, detecting L, U, Z shapes patterns (the patterns are defined by the lines in between pixels). 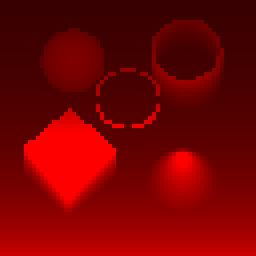 Based on shape patterns, blending the corresponding pixels with correct (anti-aliased line) weighting. 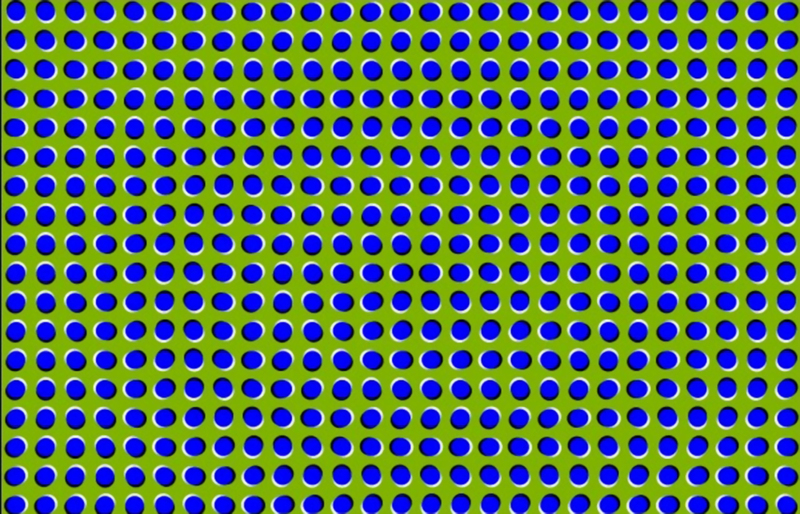 The amount of blending each pixel receives depends on the surface area split by the anti-aliased line (created by the pattern-shape). The algorithm is universal and only requires pixel data. The algorithm is designed to run on CPU, which is less attractive for real-time application. Unable to correctly anti-alias shapes smaller than a single pixel. During my specialization at NHTV it came to my attention that filtering techniques (such as Variance Shadow Maps, Percentage Closer Filtering) produce a relatively good visual result, with a low implementation complexity and GPU load in contrast to sample redistribution techniques. Near the end of my specialization, an idea was forming of attempting to use already existing anti-aliasing filtering techniques (such as MLAA, SMAA, FXAA, etc) to improve the visual quality of a regular shadow mapping technique (Lance Williams 1978). However the implementation complexity will be relatively high and the GPU load will be higher than regular filtering techniques. By using a regular screen-spaced AA-Filter, the shadow map quality exerts minor improvement, but insufficient to remove perspective aliasing. Later on I’ve found an interseting document on shadow maps in combination with FXAA. The shadow blockiness (shadow silhouette perspective aliasing) has been significantly reduced, however the the perspective aliasing is still very visible. Regular anti-aliasing filter is based on a flat-projection, which also takes insufficient parameterization into account to reduce shadow map perspective aliasing. By transforming the 2D screen-plane back into the light-space projection (the space where the original shadow map is being rasterized) and taking the original shadow map parameterization into account, the AA-Filter can be then a more specialized technique to improve visual quality of a regular shadow map. Research existing 2D post-processing anti-aliasing techniques. Determine the most suitable candidate technique for the implementation. Develop AA Filter for shadow maps based on implemented aa-filter with space transformation and shadow map parameterization. 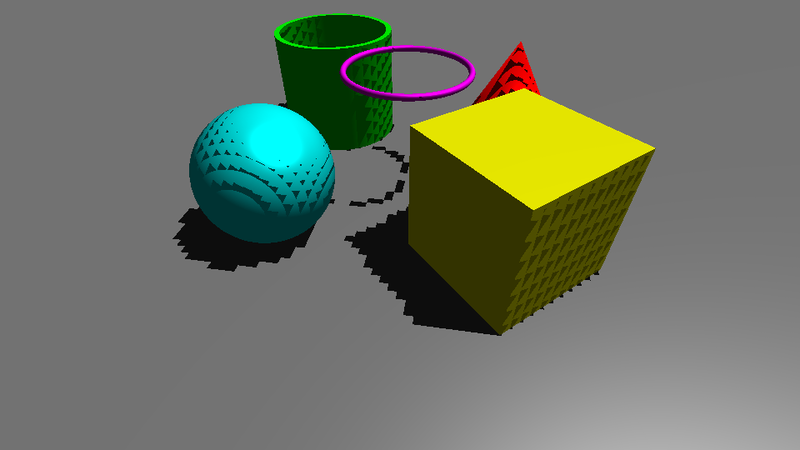 Combination with sample redistribution techniques (Cascaded Shadow Maps, Light Space Perspective Shadow Maps). Research exotic AA-Filtering techniques such as NSAA and TXAA.